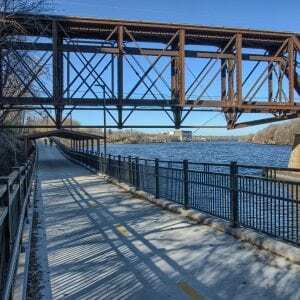 This project included the construction of a 730 foot bridge and a 1,850 foot bike path. The bridge was built over the Mississippi River necessitating specialized down hole drilling, complicated by legacy debris that permeated much of the site. Spring and fall weather conditions also made operating the heavy equipment on top of the barges a challenge. The team devised a plan to float the custom 30 foot bridge section down river, which was then lifted into place beneath a fully operational highway bridge that spanned the river valley. As part of the project, a major portion of the bike path was built into the river bluff. This required complex landscaping structures such as 1,150 square yards of anchor reinforced vegetation system, 250 square yards of integrated concrete block slope protection as well as rip-rap to stabilize the slopes of the Mississippi river.